This DVD contains 3 paddle routines including what some have called 'The Best Paddle Trick in the World!' This routine alone is worth the price of the DVD and will quickly become one of your favorite close-up tricks for kids, and you'll always carry it with you. 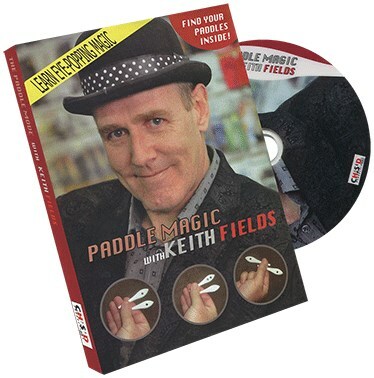 Easy to do and brilliantly routined to provide over a dozen eye-popping magical moments from the simplest of props that'll fit in your pocket..
Also included is Keith's Money Knife routine, a brand new paddle trick based on a long forgotten prop and some hilarious bloopers. You get the special spotted paddles and an instructional DVD. If you know how to do a Paddle Move, then you'll be just minutes away from mastering Keith Fields' Paddle Magic when it arrives at your home.